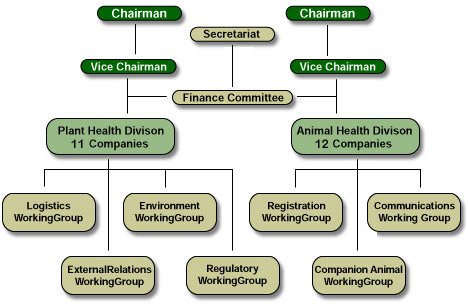 The Association has four Directors - the Chairmen and Vice-Chairmen of the Animal Health and the Plant Health Divisions - they also form the Finance Committee. This Committee, in consultation with the different divisions, decides the budget and manages the Association on an ongoing basis. Over the past 10 years the number of members in each Division has declined from almost 40 members to currently 23 members as a result of amalgamations and rationalisation within the industries. APHA has a full time Secretariat who implement agreed programmes.